Robinhood is literally turning the stock investing world upside down with their young fresh brokerage. After reading this Robinhood review, you will see how a revolutionary startup company built a customer base of over 3 million users within 3 years and matched E-Trade which had been in business since 1991! I’ll go over what can be done on Robinhood, what features are available, costs associated with the app, and pros and cons for choosing it over other brokerages. I’ll also show you firsthand what the interface looks like from a live account so you can get a better understanding of what it’s like to use Robinhood. 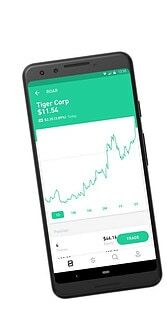 Robinhood is an online brokerage founded in 2015 and designed with an easy to use interface to make stock trading easy and user-friendly via an app on your phone. If you read my article on how to invest using robinhood, you’ll already be familiar with how a brokerage operates and what makes Robinhood stand out from other brokerages. If you haven’t read it, don’t worry, I’ll cover it in detail and give you a behind the scenes using my personal account below. Robinhood was founded by Vladimir Tenev and Baiju Bhatt who didn’t agree with the complex nature of stock brokerages and how they had to charge fees for every trade made in order to make a profit and sometimes trading took over a week to initiate after creating an account. Before, if you joined a brokerage, by the time you signed up, funded your account and initiated your first trade, a week or more could have transpired. With Robinhood, you can buy shares of stock within minutes of downloading the app. It really is that easy and the best part is it is Commission Free! What Can Be Done With Robinhood? Well obviously, you can buy and sell stock shares. That’s what put Robinhood on the map. They do offer more services however and they launch new features every year. You can also trade ETFs which are exchange traded funds. These are basically funds that track indexes, groups of similar assets or commodities. They are used to invest in specific industries rather than companies, entire indexes, and can be used to diversify portfolios. Robinhood became a brokerage for Options in 2018. If you ever wanted to get started with Options trading, it’s now available on Robinhood. Like most brokerages, there are different levels of options trading available to you based on your previous experience options trading and knowledge of trading. Robinhood want’s to be sure that you know what you’re doing before allowing you to access all options features. That’s what all major brokerages like E-Trade, Ameritrade, and Fidelity do. Most of the time there is an application process for trading options. I do limited options trading on Robinhood but I actually use another platform for the majority of my option trading. Like stock trading though, their option trading comes with zero commissions as well! Currently Robinhood is in negotiations and intends to open a checking and savings account service that pays 3% interest which is comparable to many CDs. This service is currently unavailable however. Lastly, Robinhood introduced a rewards program that gives a random free stock valued between $2.50 and $200 to users that refer their friends and gifts a stock to the referral as well. Above you see the main interface when you login. The graph you see shows the overall performance of the account on the daily chart. At the time of this post, it was after hours. If it were during the trading time of the NYSE, it would have a white background showing that the markets are open. You can also sort the chart using the links below the graph for 1 Week, 1 Month, 3 Months, 1 Year, and the Lifetime of the account. One negative to note is that there is not a lot of functionality with the graphs. You cannot select a specific range such as the 4th quarter (October 1st to December 31st). Also, you can not use graphing indicators such as MACD or other advanced chart features. I use Trading View for charting which is free. That being said, free commissions more than makes up for the shortcomings in my opinion. Watch a Live Trade on Robinhood! I figure a Robinhood Review wouldn’t be complete if I didn’t show you how easy and fast it is to make a trade. Below is a video I filmed on my phone as I walk you through a real life trade. So, there you have it, I use Robinhood regularly. Most of my money is hosted in my TD Ameritrade account but that’s because they are long termed trades that I initiated long before I joined Robinhood and it would cost me $6.95 to close my current trades. As I do close them though, I will probably move that capital to Robinhood so that future trades will be commission free. Everything I’ve mentioned so far is using the standard Robinhood account that you get when you first sign up. This account is known as a Robinhood Instant account and it grants you free commission trading, instant access to deposited funds (without waiting days for the funds to settle) and extended hours trading at no cost. If you upgrade to Robinhood Gold, you get access to a few extras for a monthly cost. One of the perks you get is Gold Buying Power which allows you to purchase shares without making a deposit. Tier I – $1000 extra buying power and instant access to deposits up to $2000. Cost $6/mo. Tier II – $1500 extra buying power and instant access to deposits up to $2500. Cost $9/mo. Tier III – $2000 extra buying power and instant access to deposits up to $3000. Cost $10/mo. There are other tiers depending on the size of your account. Robinhood Gold is by no means required to use this app. I have not upgraded to Robinhood Gold and don’t really intend to any time soon. For some serious investors, this is terrific. I’m perfectly happy with my Robinhood Instant account which is free of charge. It’s designed for easy use with a phone app. It’s only available in the United States currently and Crypto trading is still in only 32 states. Overall, I think Robinhood is an incredible app to add to your investing arsenal. If you have any questions or comments please add them below. I’d love your input. As always, if you know someone that can benefit from this review of Robinhood, please share this with them. I hope you enjoyed this review. Now, lets start trading! Money can be invested within minutes of signing up. New features constantly being added. It doesn't take days to add money to your account. It doesn't have advanced charting capability. It's only available in the United States. It doesn't have the ability to conduct much research. Crypto trading is currently only in 32 states. Get a Free Stock Today! This is really a good way to start the year by discovering what you can actually invest your money in and will yield positively well.I’ve heard about Robinhood before as a platform you can invest in and that was the only thing i knew about it but reading through this i have known everything I really need to know. I believe it worth trying and I will surely give it a try.I will strongly share this to my friends for them to also see what they need to invest in. Thanks for the kind words. Good luck to you in 2019! Great post. It’s a shame that RH is only allowed in US. I am foreign and I’d love to have this app available in other countries as well. It took me 6 months to open an Account with TDAmeritrade. I think, one Con that is still missing in your report is that, RH doesn’t allow you to buy fractions of a stock like other people can do with M1 Finance.